Theme: “Welcome brothers and sisters” - The Eucharistic Gathering – A Community of Welcome. Marie is from the Parish of Iskaheen in County Donegal and is married to Collie and they have 5 grown up children, Lee, Sarah, Kate, Denis and Fionnuala. She is Principal of St Mary’s College in Derry. 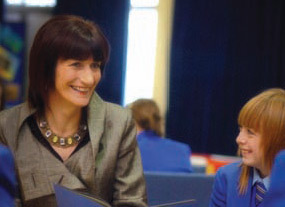 Before becoming Principal, Marie taught science in the school for 21 years and for many years was responsible for Pastoral Care in the school community. She is a member of the Pope John Paul II Committee in the Derry Diocese, proactively helping young people to take an active part in their parish community and facilitating them to grow into a relationship with Christ in the life of the Church. She was educated at Carndonagh Community School and studied Biochemistry at the University of Ulster in Coleraine. She then did a PGCE at St Mary’s College Belfast. She is a board member of the European Foundation for Quality Management based in Brussels.